Of all the things I imagined Heavy Trip would be, "sweet" was not one of the adjectives that would've immediately jumped to mind before watching this utterly charming shaggy dog story of a band chasing a dream they never really intended to catch. But here we are, in a post-Heavy Trip world, and sweet is the best way to describe this hilarious film that is shockingly appropriate for the whole family, as long as your family isn't averse to grave robbing and escaped mental patients. Turo is a twenty something metalhead living in rural Finland with a dream. He and his buddies in the band Impaled Rektum just want people to hear that they are the heaviest, most brutal band in the world, but they can't seem to make it out of the basement. A fit of inspiration after 12 years of cover tunes leads them to write and record a single amazing brain smasher and a chance encounter with the promoter of neighboring Norway's biggest heavy metal music festival sets their course. They will play the festival, and not even death can stop them. While I was definitely expecting a black (metal) comedy, I wasn't expecting the kind of sympathetic characters I got in Heavy Trip. Unlike New Zealand's Deathgasm, a film I really like that exploited a love of death metal for gore and laughs a few years ago, there's nothing about Heavy Trip that could really be seen as objectionable, and I'm shocked to say that it was kind of refreshing. Turo, played by Johannes Holopainen, is a sweet kid who still lives at home with his mom, works at the local old folks' home, and has a crush on the flower shop girl up the street. He and his band mates are a talented bunch of musicians, but can't seem to move from technically perfect cover versions of their favorite tunes to original songs. Inspiration comes in the form of a malfunctioning reindeer meat processing machine, and the thumpity thump of the carcass sets the quartet to writing the song they believe will take them to the top of the blackest metal charts, if only they can get someone to listen. Their journey is fraught with obstacles, and not unlike Homer as he sailed home to his wife in The Odyssey, Impaled Rektum have their own trials to face. The death of a member, an excitable Norwegian border guard, and a jilted crooner looking for revenge for being scorned all pile up to get in their way, but nothing will stop these four metal maniacs from reaching Valhalla and sharing their blackest metal with the world. Heavy Trip is a hilarious, loving ode to heavy metal fandom. While its characters are certainly dopey at best, the film never stoops to mock them, instead using their love of the music and passion for metal as a way to bond with the audience. 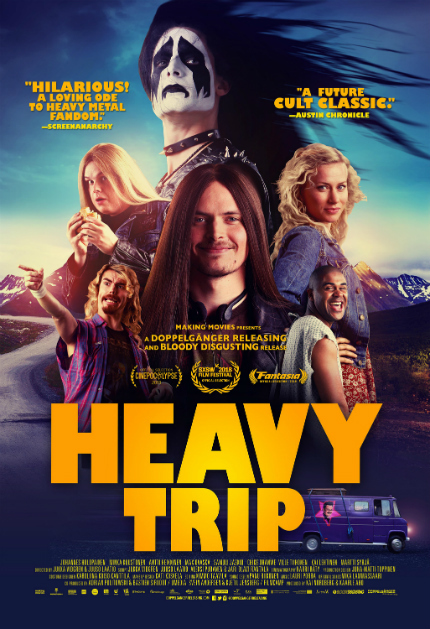 In all honesty, Heavy Trip could've been about anything, the beats for any good underdog sports movie are all in place, but the fact that it was Finnish heavy metal adds an unusual flavor and provides opportunities for comedy that haven't been explored before, making this a must see. Review originally published in slightly different form during SXSW in March 2018. Distributed by Doppelganger Releasing and Bloody Disgusting, the film will open in Los Angeles, New York, Austin, Chicago, Seattle and other cities on Friday, October 5. It will be available on various Video On Demand platforms on October 12. See details at this site.